After a hiatus of more than three years since the Saturn encounters, in 1985, the Voyager mission bulletins started issuing forth from the Jet Propulsion Laboratory again. Bulletins 68 through 80 cover the Uranus encounter. These were a little less verbose than the preceding Bulletins, but there are certainly highlights. Number 69 gives a very detailed report on the problem with Voyager 2's scan platform and the years of work they did back on Earth to figure out how to operate it safely at Uranus. Number 70 was notable because it was the first time I've seen a computer-generated view in these bulletins -- one showing the relative positions of Uranus and its moons. (I have to say I prefer the much sharper drafted line diagrams.) That one also contains a funny editorial comment on the inconsistency of the conventions used to determine which pole is north for the two oddball rotators among the solar system's planets. The updates may be less verbose because there was so much less to see in Voyager 2's approach images of Uranus than there was on approach to Saturn and Jupiter. Here's a quote from number 73, which was published on December 4, 1985, fewer than seven weeks before the January 24, 1986 closest approach. "Uranus continues to swathe itself in secrecy. No cloud features are yet visible....No radio emissions from the planet have been detected. The known satellites...obey the Keplerian laws of motion by faithfully circling the planet with monotonous regularity....The only inroad has been successful imaging of the epsilon ring." As of the previous bulletin, they still couldn't even determine Uranus' rotation rate. A tough flyby. 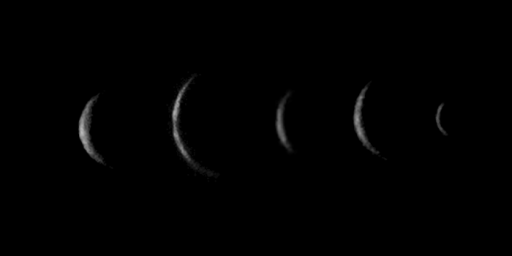 Once Voyager 2 passed by the planet, there were fabulous images of the moons as well as detailed lookback images of the ring system. But the bulletins shut down pretty soon after the encounter; the last was on February 25, 1986, only a month after the flyby. They would not start up again for two years March 21, 1988. Stay tuned for Neptune! 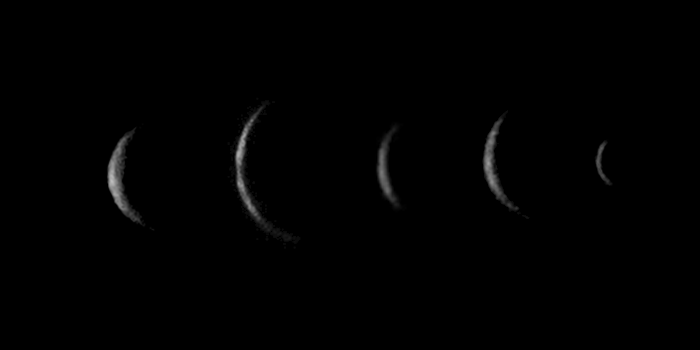 As Voyager 2 departed the Uranus system on January 26, 1986, it turned back to point its cameras at Uranus and its five major moons. At such a high phase angle, very little light was reflected from the moons to Voyager's camera, so their images were almost lost among background noise. Heavy processing was required to bring their slim crescents into view. They are, from left to right, Oberon, Titania, Umbriel, Ariel, and Miranda.